On December 22nd last year an Embraer EMB-145EP, registration G-CKAG of FlyBMI operating a flight from Frankfurt to Bristol with three crew and twenty-two passengers onboard ran off the runway during landing and stuck in the mud. The flight crew had arrived at Bristol early that morning and performed a flight to the German city which had been uneventful and were returning back to Bristol. The two flight deck crew were made up of a pilot undergoing training who was both new to the airline and the aircraft type. He was qualified on SAAB 2000s with another operator and had completed 17 hours of flight time on the Embraer 145, this was his eighth sector. The commander of the aircraft, the captain was 50-year-old company training captain with some 8,600 flying hours experience. The crew had expected to be in a holding pattern over Bristol for a short period of time, however, upon arrival, they were given clearance to land ahead of what had been expected. The landing checklist was interrupted a number of times by getting the latest weather and talking to air traffic controllers. The crew were conducting an instrument landing system category II approach and landing on runway 27 at Bristol Airport, with the pilot in training doing the flying while the commander captain doing the monitoring. On touchdown, they noticed that the aircraft experienced rapid deceleration, much more than usual. The pilot in training was unable to maintain directional control during the landing and the aircraft moved slightly to the right and then to the left. 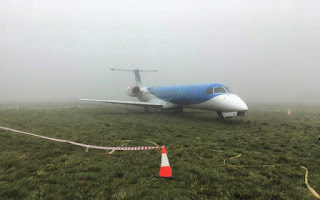 The captain applied more thrust, possibly to regain directional control but the aircraft slid off the runway, over the grass before coming to a halt as its landing gear stuck somewhat ion the mud. An investigation report by the UK's Air Accident Investigation Branch released earlier this month detailed how during the decent checklist the commander said at the second item “park brake” to which the pilot flying said on, however, the actual second item on that checklist should have been, "Seatbelt Sign" to which the pilot flying should have responded with on. 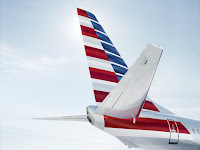 With the parking brake on the aircraft touched down with the wheels locked and not turning, the aircraft's normal braking system is fitted with an anti-skid system, which would have prevented the wheels from locking. Yet as the park brake is also the emergency brake, it isn't fitted with the anti-skid systems. The report also states that had the extra trust not been applied after landing, the aircraft would have stayed on the runway. Nobody on the aircraft was injured during the landing and excursion on to the grass, however, the aircraft's wheel rims and tyres were badly damaged. Indeed, bits of melted rubber from the tyres were found on the runway where the wheels skidded down the tarmac. There was a cluster of larger fragments approximately 400m from the touchdown, where the tyres burst shortly before the aircraft left the runway. Quite why the captain called out 'park brake' during a checklist that doesn't include it, or why the pilot undergoing training on the type just went along with it, isn't 100% clear. It could likely be just a vocal slip, we all make them every day, perhaps as many as 7 times, when we say one thing yet mean something else. He might have had the parking brake on his mind at the time for some unknown reason or thinking ahead to arriving at the parking bay, or something else entirely. The checklist had been interrupted and the flight was in a busy phase, on top of this the warning light indicating the brake was applied, was only partially illuminated and not in the direct line of sight. Neither pilot noticed the light, or that the park brake lever was activated and in the on position.